As a business owner, it is likely that you will have to work with a construction company at some point during your career. Whether you’re a new business looking to develop the right office space or you’re an established firm looking to expand locations or upgrade offices, working with a construction team at some point is very likely. So, what do you do when you and this construction team agree to the terms of the project and they fail to uphold their end of the deal? Many business owners spend hours arguing with the construction company, repeatedly reviewing the agreement, and ultimately feeling frustrated with the situation as a whole. If you’re a business owner who has been left to deal with the consequences of a construction company’s carelessness, you have options. At the end of the day, no business owner wants to spend their time in court when they could be working on their business instead. But, before you decide that you’ll just let the case go to avoid a lengthy trial, remember that mediation can often be a very powerful way to resolve the issues. If you and the construction company disagree about the quality of the work or the terms you initially agreed to, it may be the case that you simply need to sit down and hash it out together with an experienced mediator. This mediator would guide a discussion where both parties can explain their side in a peaceful, unbiased environment. It can very often be the case that both parties can come to a mutual agreement about the next steps by pursuing mediation instead of litigation. When the other party refuses mediation, or when both parties can’t reach an agreement during the mediation phase, litigation could be your next step. In this case, you’d work with an attorney to outline your case, explain how the construction company failed to uphold their end of the bargain, and pursue a trial so that you can seek justice. 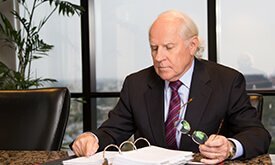 When it comes to construction litigation, you need an attorney who doesn’t back down from a trial. If a construction company cut corners, failed to perform the work they promised they would, or was generally careless during the work they performed, they are counting on you to let it go so that they can get away with it. Instead, let an attorney walk you through the pretrial process and show you exactly what to expect in court. Together, you can hold the construction company accountable for their actions.